The manuscript collections of Timbuktu represent an inestimable heritage totalling an estimated 300,000 documents, many of them from the Golden Age of the city from the 12th to 15th centuries of the Christian Era. They include manuscripts written or copied locally, as well as works produced in the rest of the Muslim world, from Al-Andalus Spain, North Africa and the Near East. Subjects treated in those works span a vast range of ancient learning: from theology to mathematics, medicine, astronomy, music, literature, poetry, architecture, as well as esoteric practices. Together they bear a unique testimony to the cultural past of the city as a centre of learning and crossroad of trade and cultural exchanges. They also contain invaluable information about the pre-colonial history of Muslim Africa. UNESCO has been involved in the preservation of these manuscripts over the decades and helped Mali create the Ahmed Baba Institute of Higher Learning and Islamic Research (IHERI-AB), which opened in 1974 and became the largest repository of ancient manuscripts in West Africa. In April 2012, the extremists occupied and damaged the Institute which had moved to new premises, built with the support of South Africa, in 2008. Much of the Institute’s hardware, including digitization equipment, was destroyed. Even worse, before fleeing the premises the extremists burned some of the 40,000 manuscripts at the Ahmed Baba Institute, possibly 3,000. But most of Timbuktu’s ancient manuscripts are to be found in some 30 private libraries which have been kept by the same families for many centuries. A non-governmental organization SAVAMA-DCI has been working with the private libraries. Since the start of the conflict UNESCO campaigned with the authorities of Mali’s neighbours to mobilize their support in preventing the potential danger of trafficking in the country’s cultural goods, including ancient manuscripts. The Organization has also mobilized Norway’s support to resume safeguarding activities for the manuscripts and the country is providing $170,000 for the project. 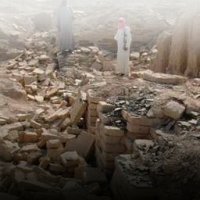 UNESCO is seeking more support for the safeguarding of the manuscript of Timbuktu, as an extension of the project conducted from 2004 to 2009, with funding from the Grand Duchy of Luxembourg. This work focused on the preservation of the manuscripts many of which are in a poor condition. Digitization of the manuscripts is also an important feature of UNESCO’s work in this area as it makes this valuable cultural heritage available to researchers and members of the public without submitting fragile documents to the wear and tear of frequent use. Another important aspect of this work concerns the training of experts so that they can apply state of the arts preservation techniques locally.